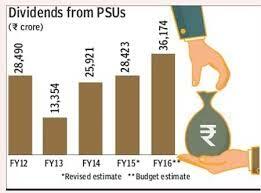 Home > Terminology - Share Market > India - Public Sector Undertakings Dividend Paying Rule..
India - Public Sector Undertakings Dividend Paying Rule..
As a law, every Public Sector Undertakings (PSUs) is required to pay a minimum dividend of 30% of its net profits or 5% of its net worth, whichever is higher. These companies and Banks are required to pay maximum dividend possible and even state governments insist them to borrow to meet the fresh capital needs. In 2014-15 (FY15), the Indian government received Rs. 34,000 cr (340 billion) in the form of dividend declared by 112 state firms. The dividend was about 44% of the net profits of these firms.